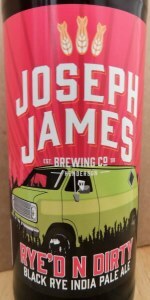 Rye'd N Dirty | Joseph James Brewing Inc.
i am quite surprised nobody else named a beer this first. its so obvious right?! not enough black ipa out there with rye in it, so i was happy to see this on tap at tivoli. it has a nice jet black look to it, lots of specialty dark malts, maybe some midnight rye as well, and a tall inch of just off white head, puffy and sticky, dense and lasting. it smells like rye for sure, rye and pine tree, almost like christmas, not at all shy with either the rye malt or the hops. spruce like a hand soap or something, the pine element is very strong. i like it with the rye spice in the flavor, and all of the ashy high char from the darkest grain elements. that said, the beer is a little tannic, some sharp spots, even a hint of tin in there, but it goes away quickly. maybe just a tad short on body too, although i think for the incoming warmer weather its right on, bigger than a brown ale, short of a porter, i think thats appropriate for the style, although my personal preference is a richer one. the hops are real bitter on the back end, which i think limit the pace of consumption. it warms up nicely though, so i dont mind. tons of flavor from the rye, shows through all the dark and the hops really well, and thats what i like most about this one. i havent had a ton of their stuff, but everything i have had from these guys so far has been real solid. Dark, mahogany brown body; thick, creamy, head; plenty of clinging, stringy fingers of lacing on the glass. Spicy nose; sweet and pine-like. Spicy, bitter flavor; strong notes of rye; some hints of chocolate. Medium body; smooth and velvety; dry finish. A well-rounded, very flavorful black IPA. Pours a murky super dark crimson-brown with a foamy tan head that settles to a partial film on top of the beer. Foamy rings of lace line the glass on the drink down. Smell is of dark roasted malt, spicy rye, cocoa powder, earth, and citrus zest aromas. Taste is much the same with cocoa powder, rye, earth, char, and citrus zest flavors on the finish. There is a mild amount of roast and hop bitterness on the palate with each sip. This beer has a good level of carbonation with a crisp mouthfeel. Overall, this is a pretty good beer with a nice balance between cocoa, rye, and citrus forward hop aspects. Rye'd N Dirty from Joseph James Brewing Inc.